Today’s ride was a brutal battle against the wind. 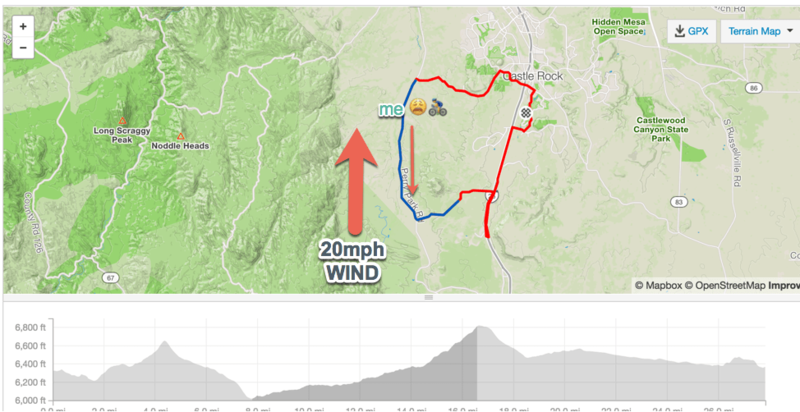 There was a 20mph south wind, and a major part of my route is a 10 mile slow climb south. I got a hint of what was coming on that first big climb and knew I was in for it as soon as I got over the ridge into the valley that ran north-south along the front range of the Rockies. That first major descent was harrowing with a brutal crosswind catching my 50mm Reynolds Assult wheels the entire way down. I was forced to ride my brakes, which doesn’t make for a satisfying descent. But then I hit the botton and headed south and boom. The wind hit me like a wall. It felt like I was climbing that wall, actually. And with gusts coming randomly pushing me into the street, it was a miserable 8 miles where I could barely get the bike to top 10mph. Not only was it painful, but the constant wind howled in my ears. I wanted to scream back at it. I think I did once. I wanted to quit. Which means what, stopping and sitting on the side of the road? So instead, I adjusted my expectations and my attitude. I told myself that this just became twice as hard as it should be, so treat it like the 8 mile, 8% climb that it feels like. Put your head down and keep pedaling. It was an amazing workout both physically and mentally. On the return leg, I had to battle south one more time, but I was so looking forward to that north-bound 5 mile stretch. The tail-wind allowed me to average 28mph. I felt like a pro in the middle of a peloton, maintaining over 30mph for long stretches on nearly flat grade. In the end, I was 15 minutes slower than the exact same route the day before. My reward for battling through that wind? I placed 213 out of 3500 riders on that northbound segment. I don’t feel bad that it was wind-assisted. All those top spots are surely group riders and/or with tail-winds too. Now I wish I pushed it a little harder. So next time you find yourself in horrible conditions, don’t quit. Adjust your thinking, hunker down, and turn it into a whole new challenge that you weren’t expecting. And feel good about the accomplishment, even though the numbers don’t reflect it. Here’s the ride on Strava if you want to check out the brutality in detail. We finally had a taste of fall here over the weekend. It only lasted a day and a half, but the hint of the new season got me taking stock of some recent developments around here. I’ve really cut back on my riding. The start of the new school year does that to me every year, but this time around it’s tougher. You see, in addition to being an instructor, this semester I’m also a student. I’m enrolled in a class for faculty that teaches us how to prepare a class for delivery online. Now, you’d think for a blogger that wouldn’t be too difficult. But this class is far more rigorous than I expected. That’s good — it means we won’t take it lightly. And it’s really opened my eyes to some of the issues that must be confronted when moving a class online. But the work I’m doing on the class on my own time is eating into other areas of my life. Like biking. Friday has always been a dependable biking day, and I can usually get some miles in then. Even if I have a bunch of meetings, which happens once a month, I can get home in time to take an hour ride. Not this time. Friday is online class day. I’m expected to be working face-to-face with my instructors, adding to the materials I’ve already created. It’s been a month since I’ve ridden on Friday. Tuesday evenings, I can often get home early to sneak in a ride of 12-15 miles. Not this time around. I’m at my desk, working on online materials. Then there’s the work around the house that must be taken care of — nothing unique to me. I know we all have our household tasks to perform. The problem for me is time management. Right now, I’m managing my time to make sure my online class work gets done. I’m not making a priority of any of the other stuff. The upside of it is, I’m fresh on the bike. 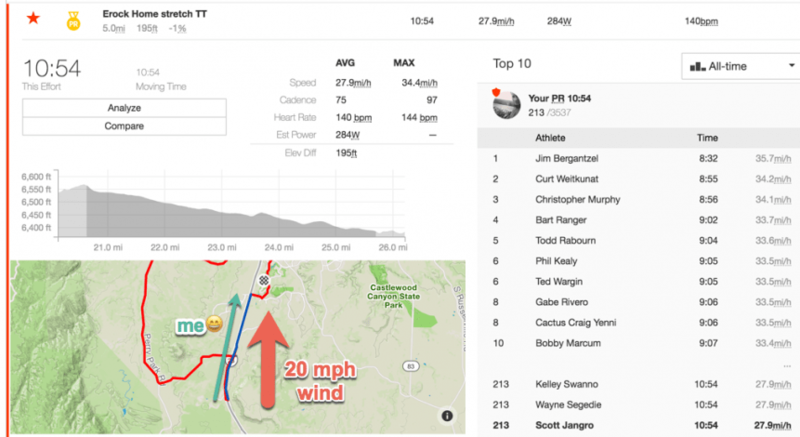 I took a two-hour ride Sunday, and racked up a couple of Strava personal records. I know that’s because my legs haven’t been put to work during the week. It felt good. The downside is, if I continue to ride less, my fitness will suffer. In the meantime, if my blogging gets spotty, you’ll know why. My wife was coming off a particularly difficult week, both personally and professionally, and was glad to go for a Saturday morning ride. We pulled on our cycling shoes and helmets, and got the bikes out on the driveway in front of our house. But then, Pat has always been more in touch with her body than I have. Just a little exercise in the fresh air, and her endorphins start firing. I don’t have anywhere near that kind of reaction to a ride. For me, it’s exercise and recreation. For her, it’s exercise and that feel-good feeling. That’s why I found it unusual when, halfway through that same Saturday morning ride, she wasn’t getting her endorphin rush. “How you doin’?” I asked, when she caught up to me at the halfway point. We had ridden up a .4-mile hill that isn’t very steep, but is always a challenge for her. After being off the bike for a week, she was really feeling the effort. Later, at home, I asked her again whether the endorphins had ever kicked in. Yeah, that makes sense. Outside pressures can make themselves felt, even when we’re engaged in some strenuous exercise. But those outside pressures stay out of my head. I do a pretty goo job of compartmentalizing, and when I’m on the bike, I’m on the bike. When Pat’s on the bike, her mind might still be at work, or dealing with extended family issues. It’ll pass. Another weekend is fast approaching, and I expect she and I will hit the neighborhood streets and roads again — and this time, she’ll feel much better for it. Gotta fire up those pesky endorphins, ya know.